You see, I’ve always been a terrible gardener. Sure, I can pull weeds and clears plots of dirt but when it came to actually growing an edible plant from seed to harvest, it couldn't be done. At least, not by me. 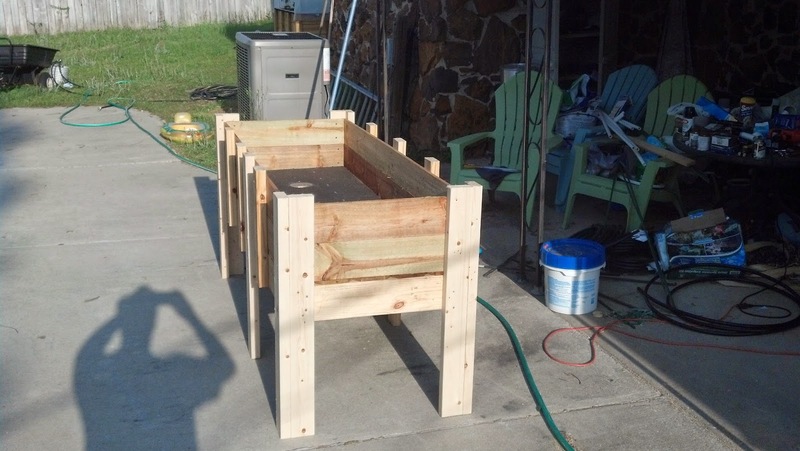 In 2012, my wife and I were meandering through a local warehouse club store and found some raised garden bed kits on sale. We thought of our grandchildren and how much enjoyment they could get from them so we purchased them. 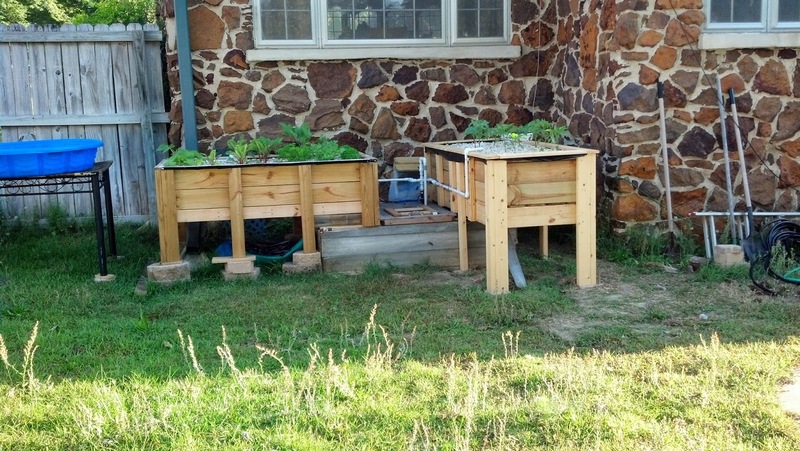 I set them up in our back yard and built a small greenhouse around them using PVC pipe and plastic (see my post from March 17th, 2013.) The grandson loved them, while the granddaughter was probably too young to really get any enjoyment out of them. The grandson grew lots of zucchini and aspired to take them to the local farmers market to sell. It was at this time that I started looking into easier ways to garden and stumbled across the concept of growing vegetables without dirt, weeds or the need to water. 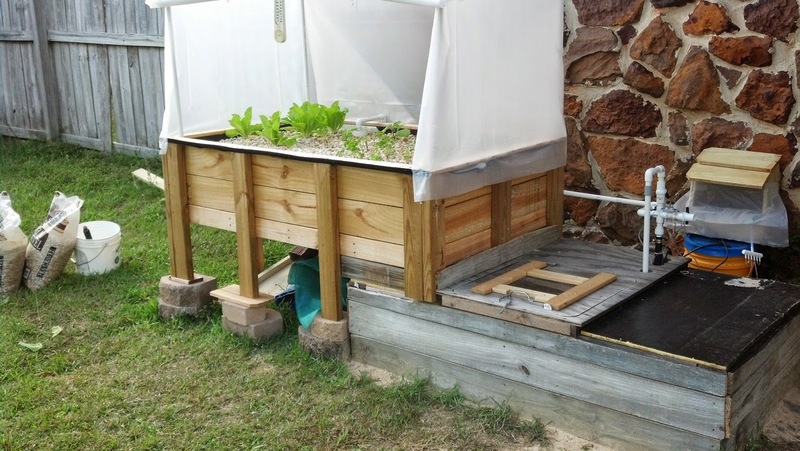 Not really sure what I was getting into, I built my system as inexpensively as I could with at least half my materials from scrap I found around the yard. Instead of forking out the $175 dollars for a pond liner, I bought a used billboard tarp for about $30 dollars. Sure, every time I look into the bottom of the tank, I see an advertisement for windshield washer fluid but it has worked great since I installed it. Continuing my theme of doing this as inexpensively as possible, I bought feeder goldfish to stock the tank and get the system going. 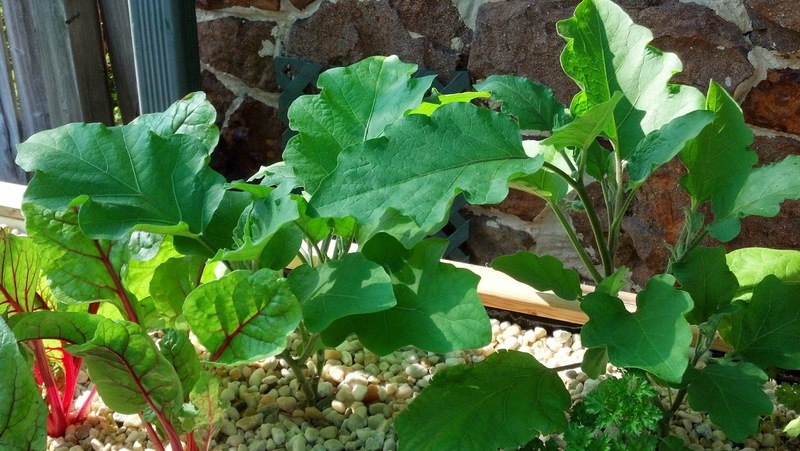 You see, in aquaponics, it is important to initially provide enough waste from the fish and at a reasonable temperature in order to allow beneficial bacteria to grow. 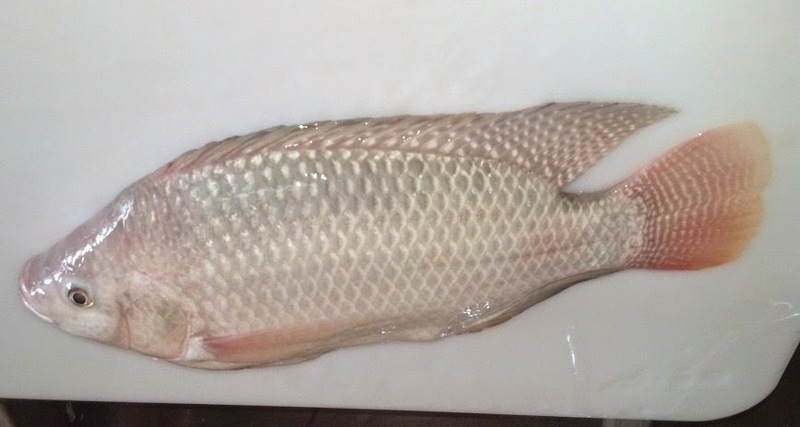 These beneficial bacteria are needed in order to convert the fish waste into plant food. The plants in turn complete the filtering cycle so the water that returns to the fish tank is filtered and stripped of all toxins that may harm the fish. The downside to this is that, if one is getting the system started using fish, there will be dead fish. This is because it takes time for the bacteria to grow into a large enough colony to effectively filter the ammonia produce by the fish. Until this happens, the ammonia level in the fish tank may rise to a level that is toxic to the fish. There are other methods available to cycle the system but I chose this one as it seemed the easiest to understand at the time. Anyway, it took about six weeks for the system to “cycle” or for the ammonia levels to go back down in the tank. 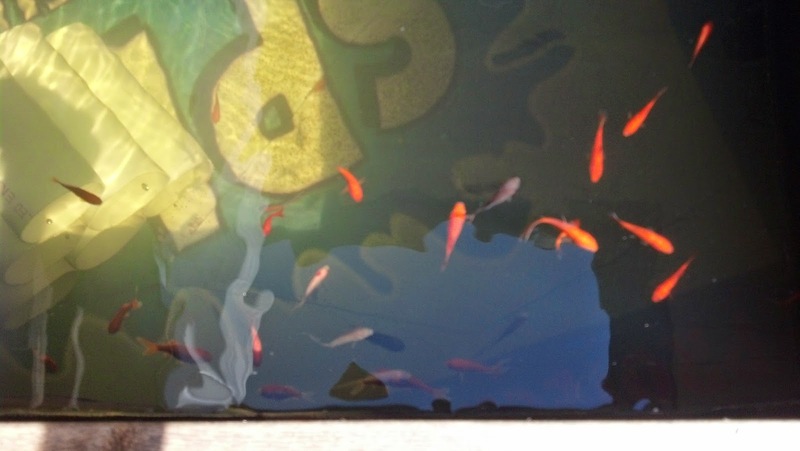 In that time I killed about twenty little comet feeder fish but the plants made it through mostly unharmed. So, there it was. 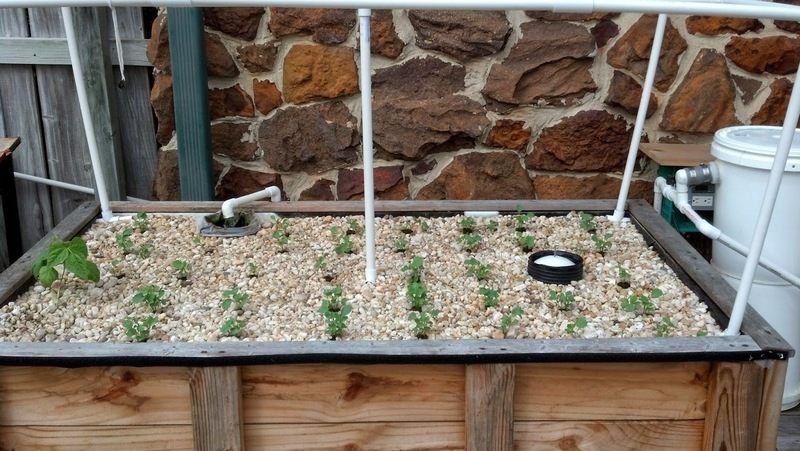 I now had an aquaponic garden. At first I planted starts that I bought from the local home store. 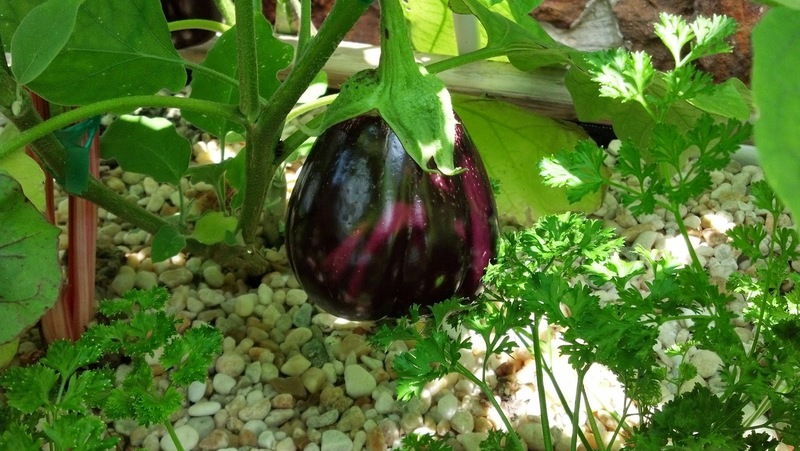 I wasn’t sure exactly how to start plants from seed as I’d never done it any other way except for just throwing the seeds out in the dirt garden and adding water. Nonetheless, and despite the cold, the plants started growing. Once the system was in operation, I decided to add another grow bed. 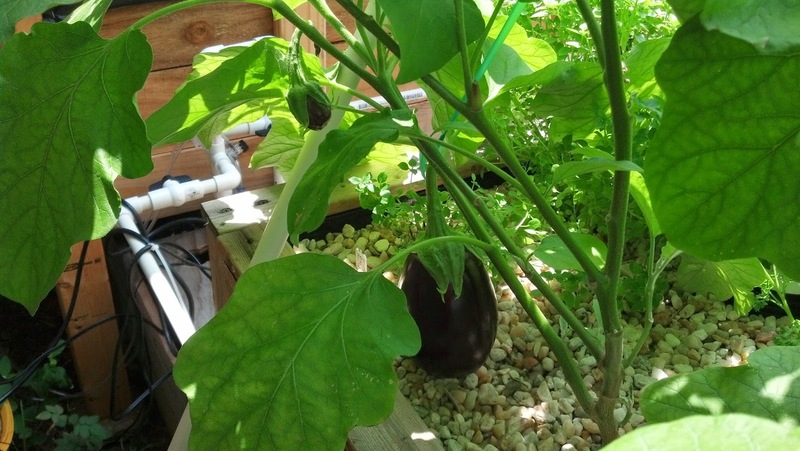 The first grow bed would not be sufficient to filter all the water once I added tilapia to the system. So I built another smaller grow bed for the other side of the tank. The grow beds are about one foot deep and filled with pea gravel. The gravel is heave but I did not want to spend the money on expanded clay pellets. Besides, my goal was to develop a system that could be easily built with local materials. I quickly found that, where I live at least, there are just some things that must be purchased through other means such as ebay or the on line part of the large chain hardware stores. By this time, we were in the middle of Spring so the cold was becoming less of a problem. 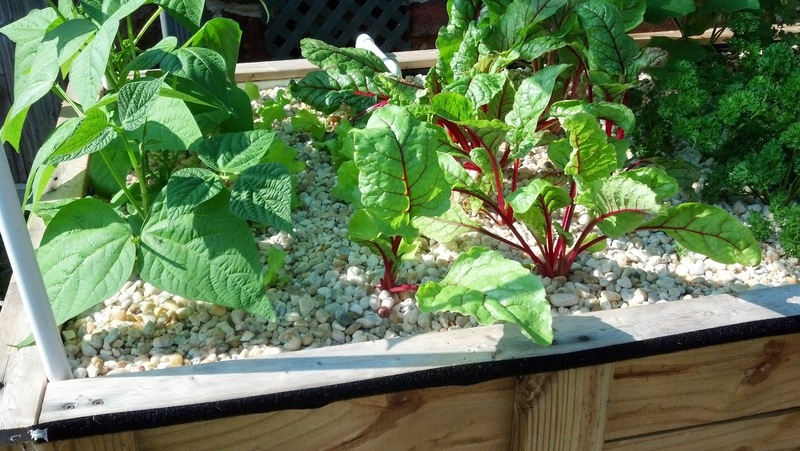 With the warming temperatures, I started realizing the true awesomeness of an aquaponic garden. This awesomeness can only be explained by showing you actual plant growth. In the picture above showing my first grow bed you might see some plants in there. 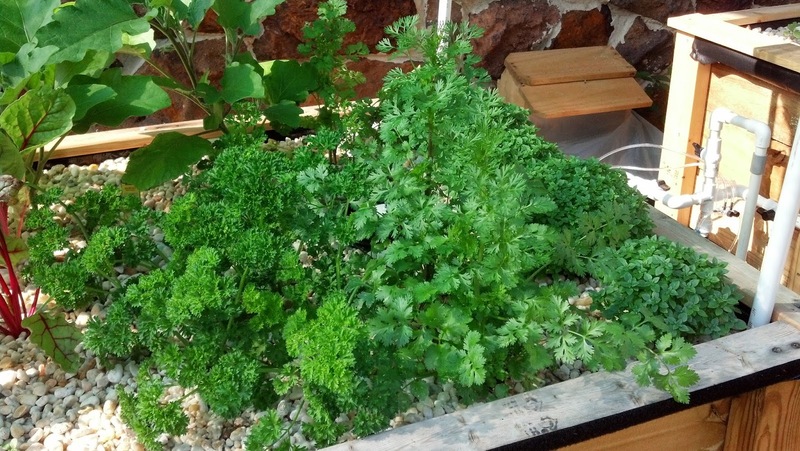 Planted in that grow bed was Lettuce, Swiss Chard, Parsley, Cilantro, and Boxwood Basil. 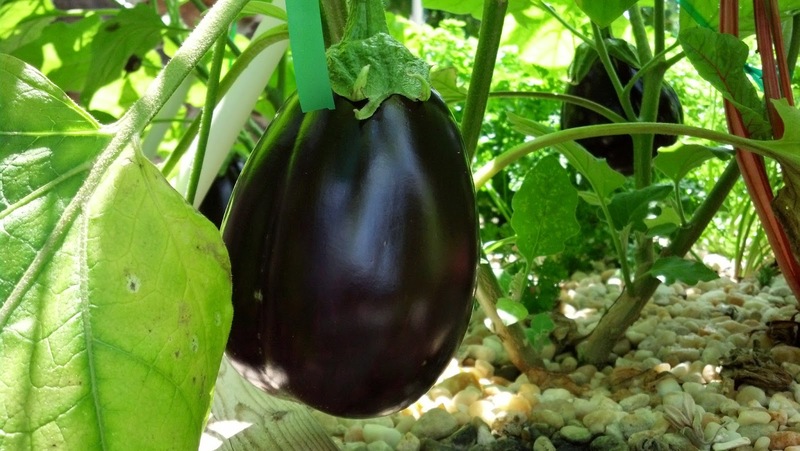 In the picture below with the second grow bed I added two Eggplant starts and, in the second grow bed, some Green Pepper plants. The above picture was taken on 15 May 2013. 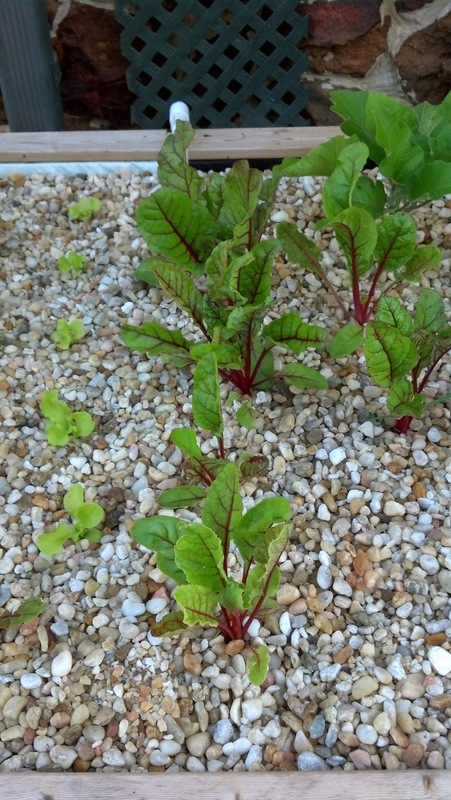 Here’s some close ups of the swiss chard and eggplant taken the same day. The pictures below were taken nearly a week later on 20 May 2013. The next set of pictures were taken about a month later on 20 June 2013. This is when I began harvesting my first crop and replanting. There has not been one day since then that I have not had something growing in both of my grow beds. My only input to the system is food for the fish. 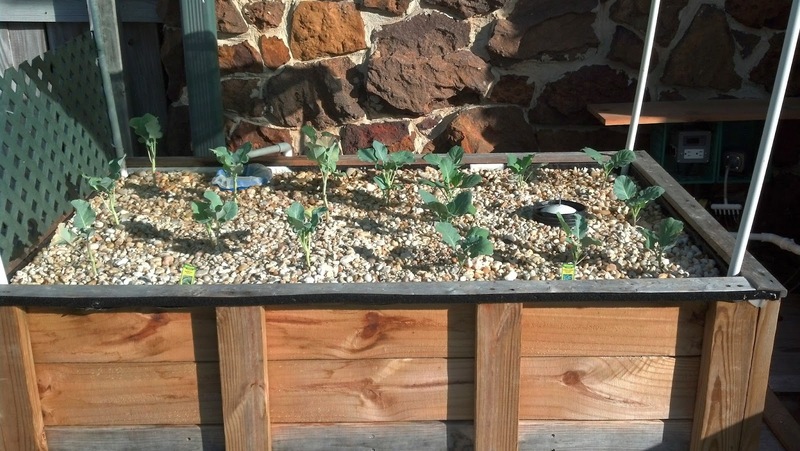 In October, I decided to try my hand at Broccoli and Collards. Below is a picture of what they looked like on 13 October 2013. 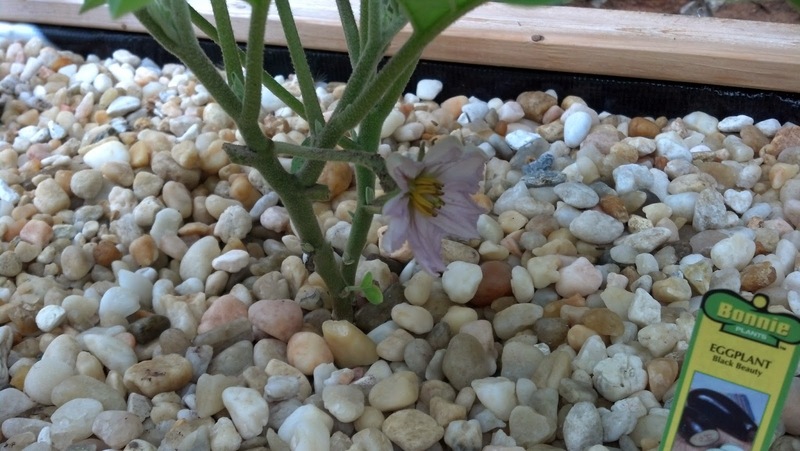 Below is a picture of the same plants on 29 December 2013. We make broccoli casserole and collard greens on 1 January 2014 and they were delicious! 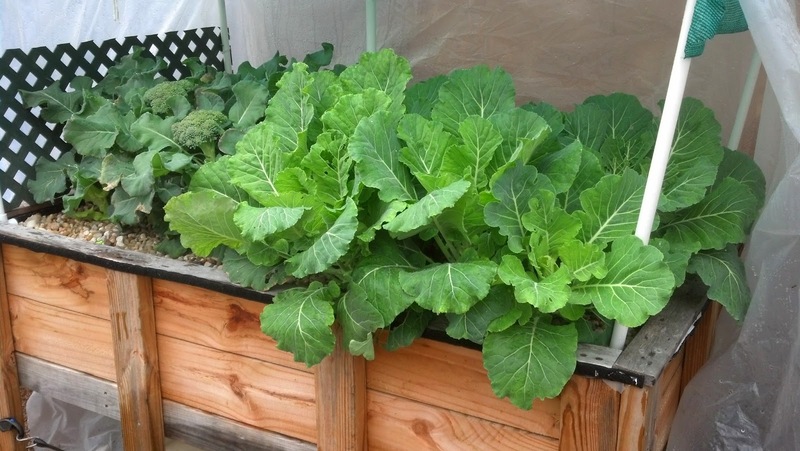 I grew some lettuce in this grow bed throughout the month of January while I started more collards from seed. 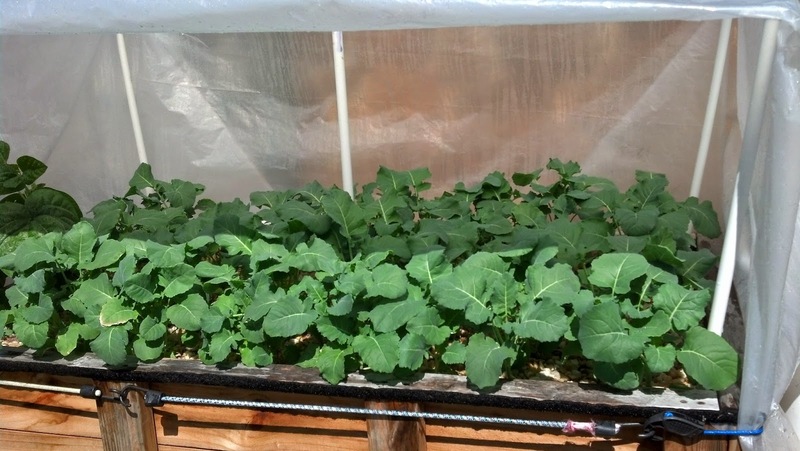 At the beginning of February, I transplanted the collards into this grow bed. They took off immediately. By the middle of March they’d grown quite a bit as shown in the picture below taken on 17 March 2014. By 25 March, they were ready for harvest and I immediately put another new crop into the space. I did not have to prepare the soil. I did not have to pull weeds. I simply spread apart some gravel with my fingers and placed the new plant starts into the hole before covering it back up. 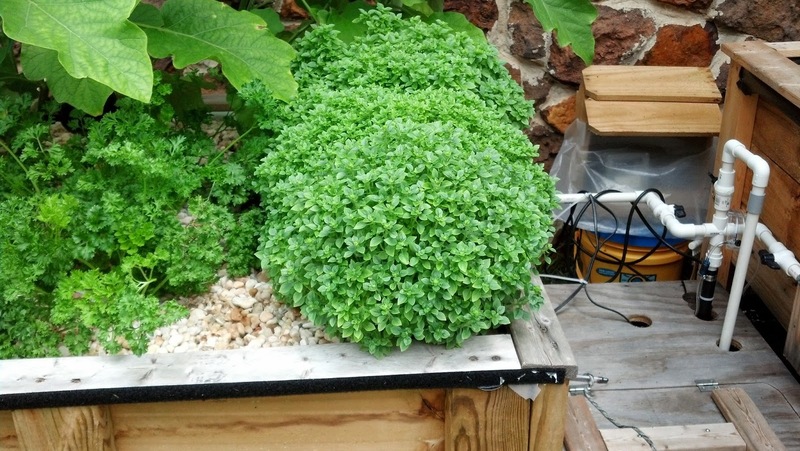 So, I would say that my first eighteen months enjoying the benefits of aquaponic gardening have been successful. 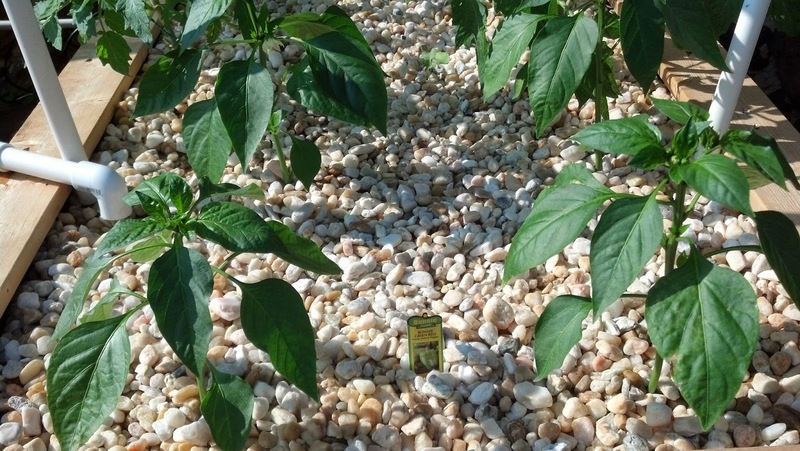 Oh, and I did not even mention that this garden also provides us with fresh tilapia that are completely natural with no additives or carbon monoxide! 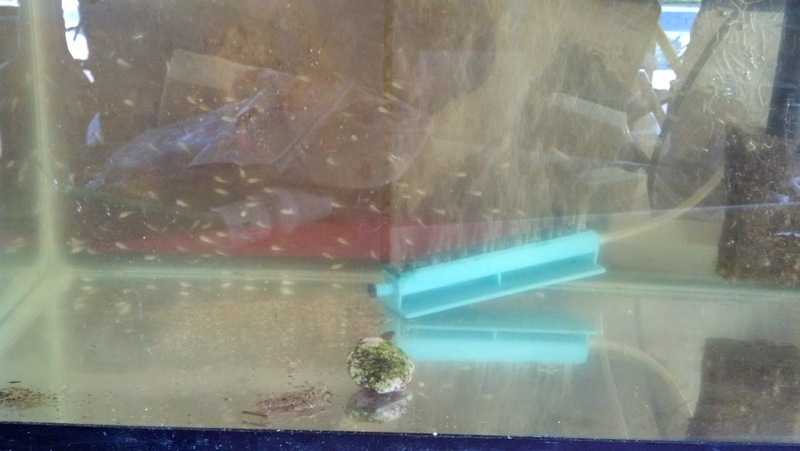 In June, as I was considering a new purchase of tilapia (originally cost only fifty cents each from a local fish farm) I discovered some new little babies swimming around. So, I put them into a small aquarium for safety until they are ready to go back into the large tank. The cycle continues and I can continue to harvest both fish and plants. With only fish food as an input to the system, I can truly have an endless supply of fresh fish and vegetables! For more information and video of this content, click this link to visit my youtube channel and see the rest of the story.